NAB 2013 will be remembered as the year of the improvement or refinement of existing products. This is true for many manufacturers but not Redrock Micro. 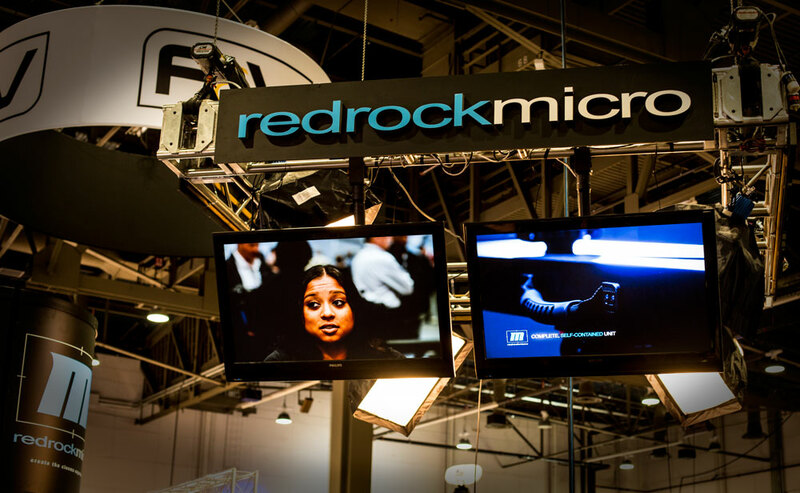 Redrock came out strong at NAB 2013 with a new device that promises to help budget conscious producers raise the bar without increasing their budget or crew. 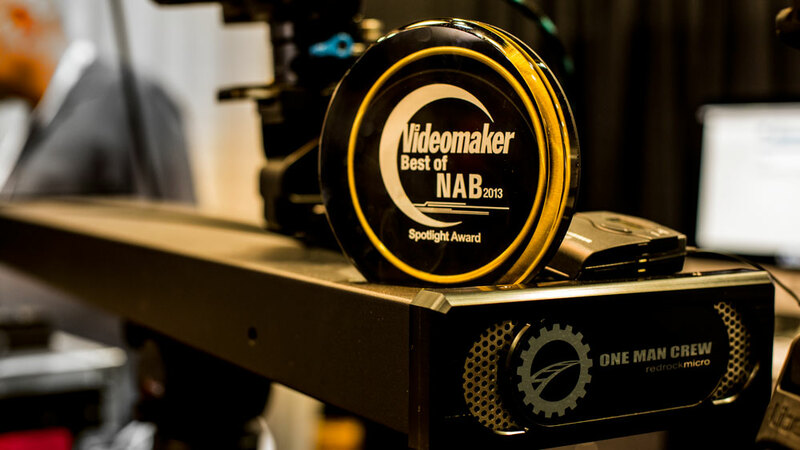 As a testament to its ingenuity, the new ‘One Man Crew’ took two awards at NAB: Videomaker’s NAB Spotlight Award, and DV Magazine’s Black Diamond Award. The ‘One Man Crew’ is a a new class of motorized ‘parabolic slider’ that operates unattended. It delivers smooth and elegant motion to what would be an ordinary, static shot achieved via a tripod. There’s absolutely nothing to assemble and no additional parts or motors to by to make it work. It’s rugged and durable and sets up on a tripod or any flat surface, again requiring no special set up or additional crew to operate or carry. The heavy load tilt head will support a max load of twenty pounds. The unit comes with a power supply, carrying case and even has a handle on the body, making it easy to carry and move. The simplicity can’t be over stated. Using a laser alignment system that shoots two intersecting lasers that show where the subject should be positioned, the ‘One Man Crew’ makes sure that your subject is in the perfect spot saving you time and trouble. Simply set it up on your tripod, counter, bed, dresser, keyboard stand, etc., attach your camera, line up your subject, and you’re ready to go. “Don’t believe the hype!” This is my motto when I hear about something that sounds too good to be true. However, the proof is in the product, and I highly recommend watching our video and seeing it in action. The ‘One Man Crew’ produces absolutely smooth shots, and the results are spectacular. Combined with its ease of use and an incredible price point of $1,495, the ‘One Man Crew’ is something every production crew (big or small) should have in their arsenal. Hollywood, CA and Dallas, TX – Redrock Micro, the recognized leader in affordable, professional-level cinema accessories, today announced the all-new One Man Crew™, a new class of motorized ‘parabolic slider’ that operates unattended and delivers elegant cinematic motion. The One Man Crew is particularly effective for individuals and small crews who want their footage to stand out and have the look of being shot by a professional camera crew. The One Man Crew’s compact design, lightning-fast setup, push-button ease of use, and unattended operation makes it the perfect choice for corporate interviews, documentaries, and production/tabletop video. Leva FilmWorks, a leading content provider for Warner Bros., Lucasfilm, Universal and others, used the One Man Crew recently as they shot interviews for their documentary celebrating the 75th anniversary of the iconic film The Wizard of Oz. 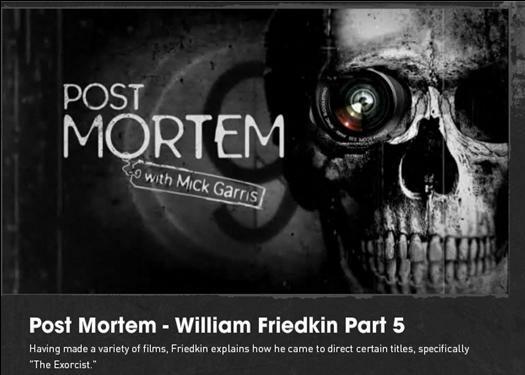 The company regularly shoots interviews with show business giants, from Meryl Streep to Steven Spielberg to Usher. Independent Director of Photography Johnny Derango also had the opportunity to use the One Man Crew. The One Man Crew is the first and only parabolic motion system available designed to provide elegant cinematic movements while keeping the subject both in focus and stationary in the frame. Most importantly, it does this without any operator involvement. The 36” long track offers great flexibility and can set shorter limits for motion. The One Man Crew allows for camera speed change in real-time and manual start/stop/change direction with speed ramp up/down for consistently great footage. The One Man Crew is the perfect addition for small crews doing corporate or documentary interviews that require fast setups and great images. One Man Crew can be used with a single camera for a high-end production feel, or on a second camera for cutting between shots with additional footage. One Man Crew’s smooth, controlled, repeatable motion is also great for product and tabletop photography and adds that extra sparkle. One Man Crew can be set up and prepared for production in minutes thanks to its lightweight, self-contained design, intuitive laser alignment guides and push-button ease of use. The One Man Crew can be unpacked, set up, and ready to shoot in about a minute by a single person, and can be mounted onto a standard tripod via its integrated ¼”-20 and 3/8”-16 cheeseplate on the bottom of the unit. It also features rubberized feet for low profile tabletop placement for maximum versatility. One Man Crew contains everything needed for use and is production-ready straight from the box. The included Heavy Load Tilt Head works with virtually any camera and has the ability to hold up to 20 pounds. One Man Crew is powered by an included AC adapter (with international plug adapters) and comes with a soft carry case for easy transport to and from productions. The One Man Crew is available as a complete kit for $1,495 and is available for pre-order. As with all Redrock products, customers can purchase direct from Redrock Micro’s website at store.redrockmicro.com, or from any of Redrock’s worldwide authorized resellers.